You could spot it from space and it attracted selfie seekers for hundreds of miles (well, at least until the Museum of Ice Cream opened a month later). Yes, the super bloom of 2017 was epic. 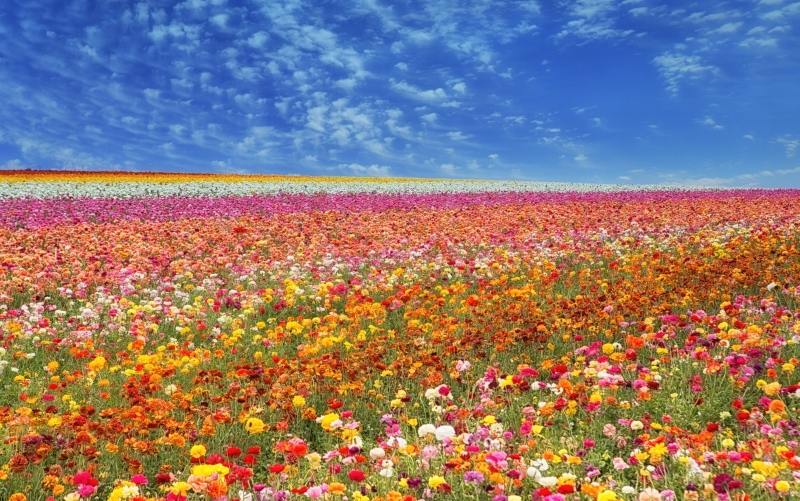 But while this year won’t bring another “Flowergeddon,” a weekend trip to Carlsbad, California, will cure what ails any Angelenos yearning for a botanical outburst. Located just 87 miles south of L.A., Carlsbad is home to 50 acres of radiant ranunculus that grow in color-coordinated rows. (It’s also home to Legoland—arguably just as colorful, but decidedly less fun for frolicking.) The blooms here are commercially grown, so you’re guaranteed some bud sightings worthy of your journey down the 5. And because the city is so proud of its flora, it’s brought back the Petal to Plate celebration for a second year. Through April 15, Carlsbad will become a haven for flower fanatics, with blossom-focused food, cocktails, and spa treatments at local restaurants and hotels. Here’s how to create your own weekend super bloom.